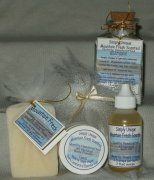 High quality, All Natural Skin Care Aromatherapy Bath Kits! Each item scented to match the Kit Scent Theme! See each scent in it's own site.